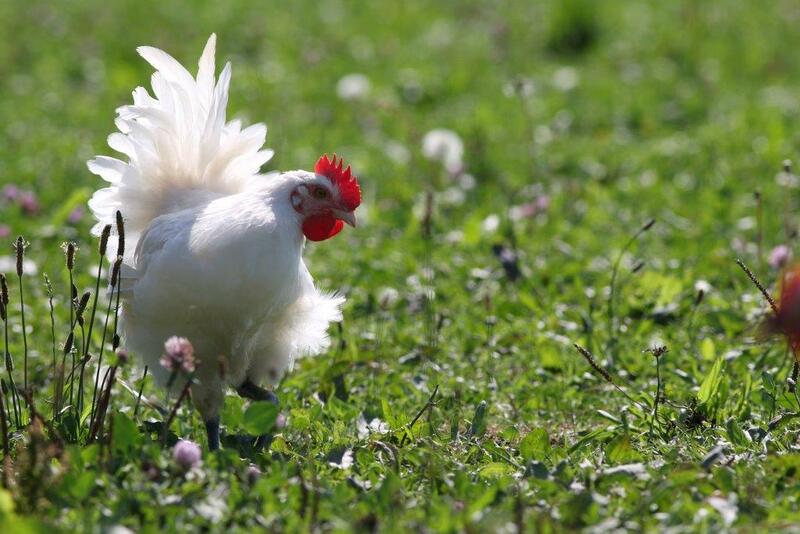 Bresse is a small area of the French Rhone-Alpes region where a very special chicken breed has lived for centuries. Thanks to a careful breeding respecting the animals’ needs and giving them high quality food, eating a Bresse chicken or capon is both a taste pleasure and a height point of Slow Food. 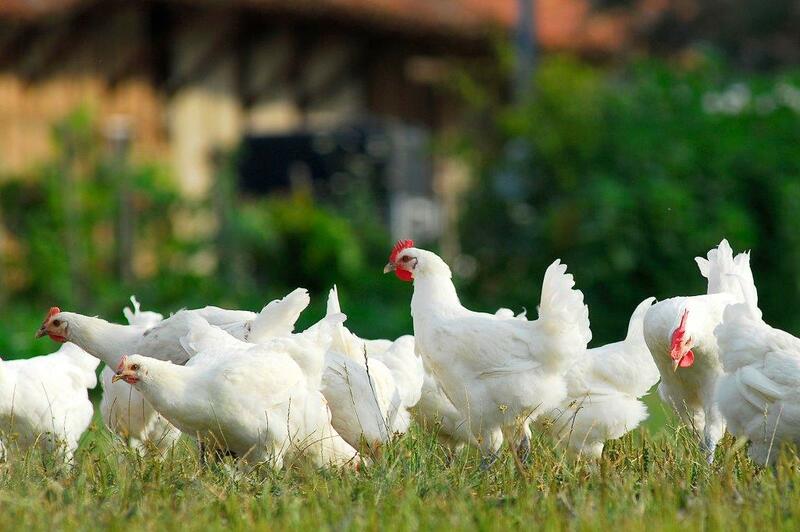 Unless standard chickens that are bred for 40 days before arriving in our plates, Bresse chicken are outdoor-raised birds for at least 150 days, fattened hens for 5 months and capons enjoy a peaceful yet active life for more than 8 months. A capon is a rooster chosen among the most beautiful ones that has been castrated at the age of 8 to 10 weeks in order to get a fatter bird tasting juicier, more tender and with a matchless depth of flavour. In 1957 the Bresse chicken was the first poultry breed to get a label of origin (Apellation d’Origine Controlée or AOC) in France and still is the only one 58 years later. There are approximately 300 farms that can breed these birds following very strict specifications. 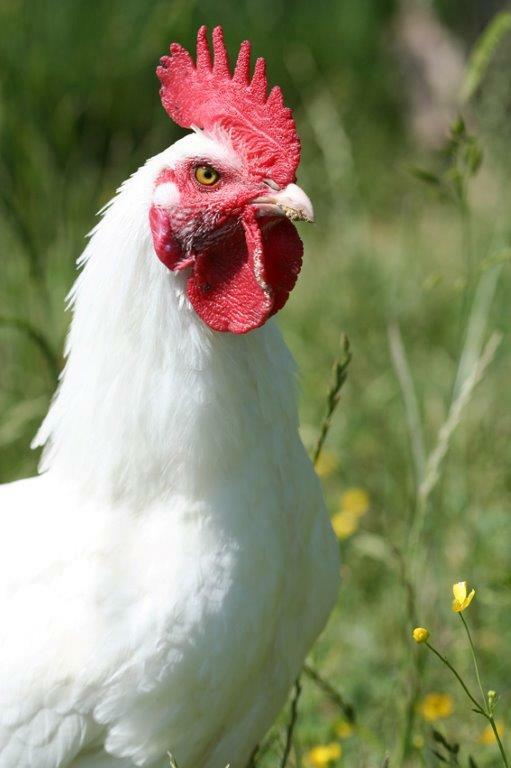 The local breed is called Bresse Gauloise (Gallic Bresse) and if you go to Bresse you will easily spot them with their pure white plumage, red comb, blue legs and black eyes, running in the meadows. Living in small farms they escape overpopulation and it keeps them from diseases allowing the breeders to avoid antibiotic use. A good example of their commitment to quality! The chickens have a minimum allocation of ten square meters each but most often they get much more. They are fed with cereals, mostly corn grown by the breeders (soya and GMO are strictly forbidden), and milk. These are high-fat food but with little proteins thus encouraging the hens and roosters to peck wild little insects, earthworms and grass the way chickens have been naturally doing for ages. A true chicken’s life as far as can be from industrial battery hens! But everything must comes to an end and 2 to 4 weeks before a glorious ending in our kitchens, the chicken are put inside wooden cages called “épinettes” in a quiet half-lighted room to be fattened. Breeders take care of the slaughter, then in order to get a perfect looking skin the chickens are plucked using “dry plucking”. Everywhere else most chickens are scalded in hot water in order to make plucking easier, but in Bresse they take time to make it the traditional way, they even cut the down with scissors! But the chickens are not ready yet and the most beautiful specimens will go through the “roulage”. 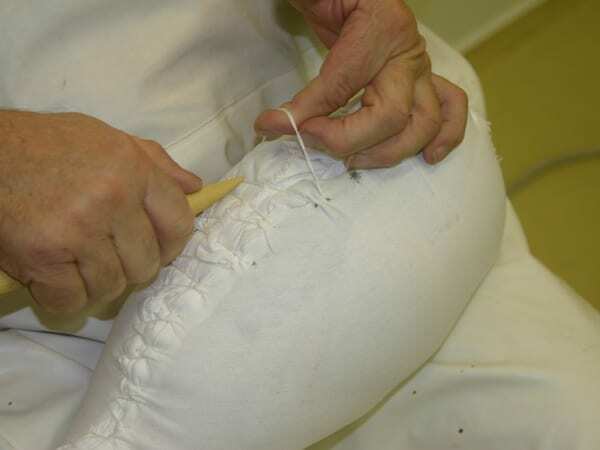 Using a piece of linen or cotton cloth each chicken or capon is wrapped up and tightly sewn and kept this way for several days. Thus it will not only take the shape of a rugby ball but its fat will slowly melt into the flesh making it tender and tasty. 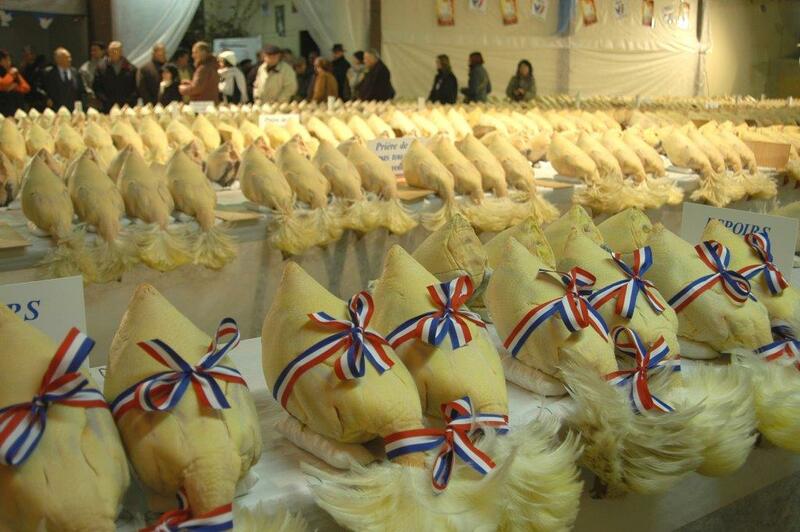 Every year in December four big poultry markets take place in four different towns in Bresse, they are called the “Glorieuses”. This is the best time to buy your Christmas’ or New Year’s Eve capon or fattened hen that are bred to be ready for this time of year. In a festive atmosphere the local breeders are proud to show the work of a whole year and compete to win an award. All the chickens, fattened hens and capons are lined up on long tables to be chosen by local chefs and mere customers. 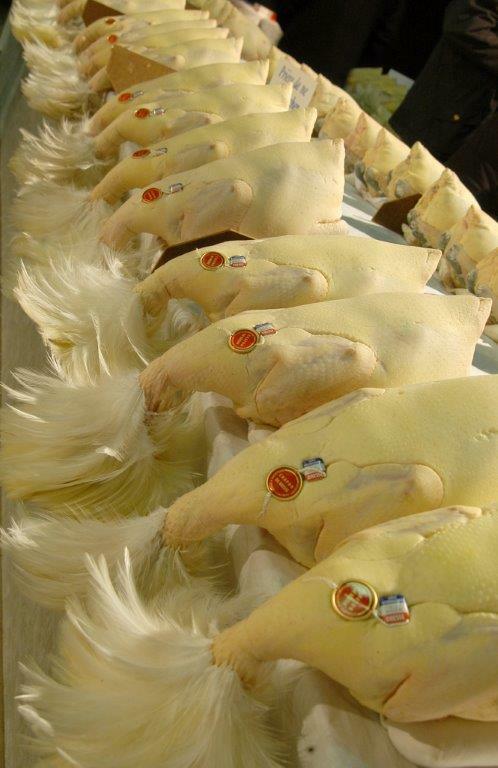 Be aware that Bresse poultry is a luxurious produce and a costly one. Pricing reflects the value and the amount of the farmer’s work and care for such a unique poultry. If you are lucky to go skiing in the Alps, Bresse will be on your way, north of Lyon. Why not make a detour? But even if you stay home you can get one on line. 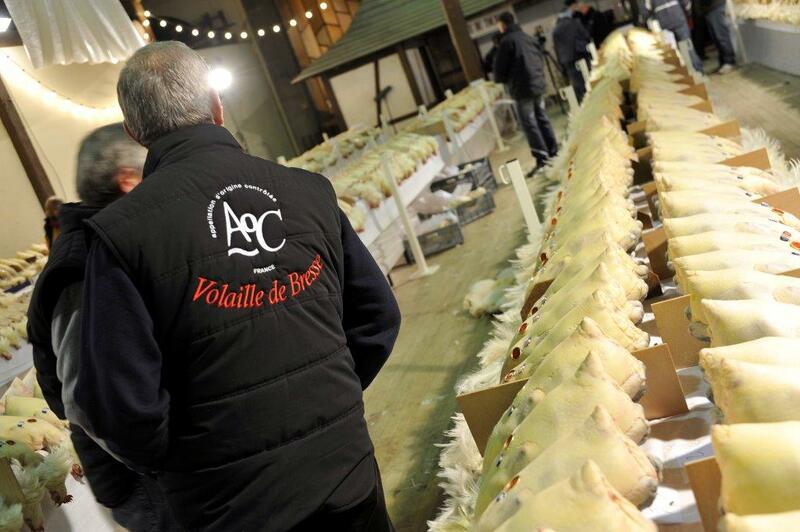 Remember that a real AOC Bresse chicken wears a ring, a label and a metallic seal that guarantee its origin. Cooking Bresse poultry is easy; it’s such a wonderful produce that you won’t need a complicated recipe to get the best of it. You can cut it into pieces, cook them at low heat in a casserole without any added fat for 30 minutes, had three-quarter of a litre of dairy cream and let reduce for 30 more minutes. To make it sumptuous you can add some white dry wine such as Vin Jaune from the Jura area, and morels. Believe me you will never forget the smell that will invade you house and your friends and family will get on their knees in gratitude for this unforgettable wonderful meal! To go to the “Glorieuses”: they will take place in Montrevel on December the 15th, in Bourg-en-Bresse on December the 18th, in Louhans on December the 19th and in Pont-de-Vaux on December the 20th.